Using a fork, combine graham cracker crumbs and sugar. Stir in melted butter. Measure out approximately 1½ tsp of the graham cracker crumb mixture into the bottom of each shot glass and lightly tamp down. Set prepared shotglasses aside and make your cheesecake filling. In a small saucepan over medium-low heat, stir together milk chocolate chips and heavy cream until melted. Remove from heat and allow to cool at least 15 minutes and until chocolate is not hot to the touch (you don't want to melt your shot glasses). Layer 1-2 Tbsp of chocolate over the graham cracker crumbs. Place dessert shooters in the fridge so that the ganache can harden as you prepare your cheesecake layer. In KitchenAid or with electric mixer, beat together cream cheese and marshmallow fluff until completely combined. Add cool whip and beat on medium-low speed until smooth. Be sure to scrape down the sides of the bowl. Scrape the cheesecake mixture into a large ziploc bag. Snip off one corner and pipe the cheesecake filling on top of the milk chocolate ganache. Top with marshmallow (toasted or not) just before serving. *12 oz is 1 and a half small containers of cool whip. With most recipes, measurements are critical, but for this one you have a lot of leeway with the amount of whipped cream that you use. Use one full 8 oz container and roughly 1/2 of the second. Also, this marshmallow filling is very sweet, so do a lot of taste testing and if it is too sweet, add up to the remaining 4 oz of cool whip. **If you are going to add marshmallows on top or toast them, do it immediately before serving, as they get a bit stale and hard in the refrigerator. 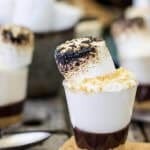 S'mores Cheesecake Dessert Shooters https://sugarspunrun.com/smores-cheesecake-dessert-shooters/ Find more great recipes at SugarSpunRun.com!